THE PURCHASE THAT GIVES BACK. Are you looking for the perfect present for someone special. This attractive hammered ring is stackable and stylish. We create great gifts for giving. A great choice of gifts for birthday, anniversary, holidays, stocking stuffers, graduation, Xmas, Valentine's Day, mother's day, and any other occasion. Benevolence LA is an easy, fun, fashionable, and effective way to help others. Our mission is to spread generosity. This is why each of our products are connected to a specific charitable cause. This necklace gives 10 percent toward our next clean water project with our charity partner, Hands 4 Others. All our products come with recycled gift packaging, perfect to give as a gift to someone special. We started Benevolence LA to make a difference. Isn't this what we all want, to help people? We've connected something you are already interested in buying with helping others, allowing you to give back in a new way. BENEVOLENCE LA was founded in 2015 with the idea that the jewelry we wear can not only tell a story about who we are but it can help give back to the world around us. In late 2015, Benevolence LA was featured on ABC's The View as a brand who gives back. We are celebrity endorsed and eco-friendly jewelry with a purpose. Our Mission is to create beautiful and handcrafted pieces that tell a story. When you purchase a Benevolence LA product, you are joining the mission. By purchasing this bracelet, you are helping the benevolence movement. You give by buying. You give by wearing. Not completely satisfied? We'll make it right, no questions asked. All of our products have our 30-day return policy which means you can experience your new necklace risk-free. Click the, Add to Cart button now, and make a difference while feeling good wearing this beautiful hammered silver ring. NEW PRODUCTS COMING SOON: Join and make a difference today. UNIQUE PAIR OF RINGS: A whisper-thin ball chain made with luminous 14k gold. 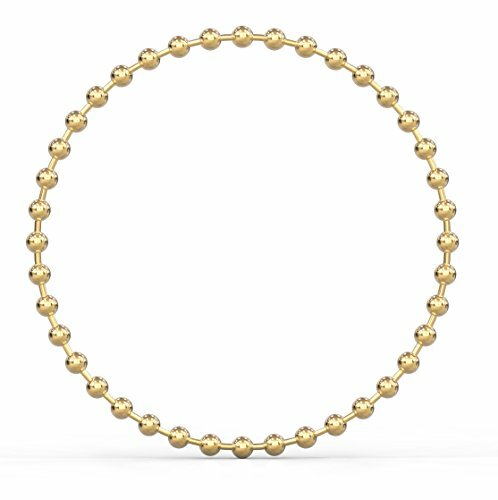 This 14 karat gold ball-chain ring is not rigid, it is a soft, like a chain wrapped around your finger. Wear 1 at t time or as a pair. HANDMADE: Made by hand from real 14k gold plated brass for long lasting shine and durability.